Product Name: 7009 Cleanroom Wiper Product Information: 7009 Cleanroom Wiper is the microfiber structure, featuring with softness,compact structure, lint-free performance, excellent water absorption, good effect and strong decontamination ability. Product Information: Microfiber cleanroom wiper is the microfiber structure, featuring with softness,compact structure, lint-free performance, excellent water absorption, good effect and strong decontamination ability, and it is washed by the 18 megohm ultra-pure water for many times. It is washed in the 10 grades purification room and it is the dust-free vacuum package with the Laser sealing side. Material: 70% terylene, 30% nylon shuttle woven cloth; Gram Weight: 170g/㎡. Application Fields: Electron, chip, semi-conductor, LCD display, precise optical instrument,etc. Features:1, Ultra-thin type, close formation, the same tensile force of the longitude and latitude orientation, without generation of soft flocks; 2, Exquisite material, soft hand feeling, no damage to the surface of the precise machine; 3. Strong oil adsorption capacity, good dust-removing capacity; 4, Four-side seal to prevent the overflow of the wool and dust particle; 5. 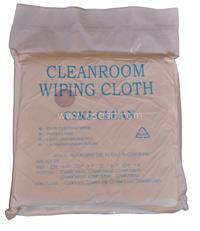 Economical non-dust cloth; 6, Lower contents of ion and micro-particles and lower residual.